Do you love to cook with seasonal ingredients? To me, nothing is more fun than going to a farmers market or local farm and getting fresh fruits and vegetables during the harvest season. This is the time of year when you can really get some good deals and make the sort of fall recipes you crave all year long. The problem for me, however, is finding great recipes to use them in. I have some seasonal cookbooks but many of them require unrealistic ingredients, 0r in all honesty, have recipes that aren’t very appealing. 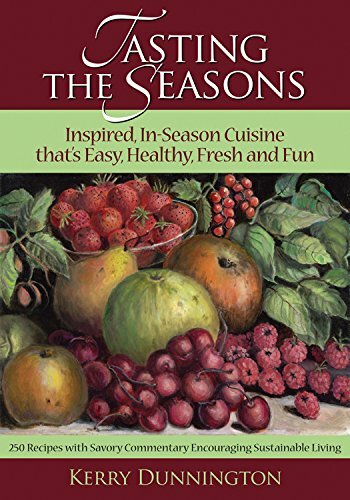 As I was looking for some new cookbooks, I was approached to review a new seasonal cookbook – Tasting the Seasons: Inspired, In-Season Cuisine That’s Easy, Healthy, Fresh, and Fun. After reading a bit about this book online, I couldn’t wait for it to arrive in the mail! Looking for a cookbook that focuses on healthy, seasonal recipes that are realistic for busy cooks like you and me? If so, we think you will love Tasting the Seasons. This cookbook contains 250 recipes and commentary on the recipes created by culinary expert Kerry Dunnington. All the recipes in the book are designed to be made in your home kitchen, and for entertaining friends and family. While the approach of the book promotes eco-friendly, sustainable living, it also is realistic, allowing busy cooks like us the chance to feed our families meals that we are proud to put on the table. Once you have tried some of these delicious recipes you will never go back to high fat, processed food recipes again! Okay everyone, I have to say this may very well be one of the best cookbooks I have tried in awhile. All the recipes are realistic, have easy to follow directions, and the ingredients are made using seasonal foods that are perfect for foodies like me. After going through this cookbook, I can’t wait to get in the kitchen and start cooking. Now all I need is a trip to the local orchard or to send my husband to the grocery for us while I work! Probably the best section in my eyes, however, are the soups. Many of the soups sound absolutely heavenly, and are meals you would expect to find on restaurant menus. Based on our own experience, I am happy to give Tasting the Seasons an A+ rating! Would you like to purchase this yummy cookbook for your own family? You can find Tasting the Seasons on Amazon.com for $14.46! Thanks for the review. It’s been a while since I tried a new cook book too! This looks like a great cookbook to pick up a few copies – to keep one, and to give as hostess gifts, etc!! I love cooking seasonally, right now fall cooking is so awesome, I’d love to to try new recipes! I love the idea of this cookbook. Thanks for the review and I’ll look forward to trying some of these recipes. I love using fresh ingredients whenever possible. This sounds like a great cookbook. I like the price too. I think I’ll pick up a copy. This cookbook sounds great, as I have been interested in using seasonal fresh ingredients in cooking lately. I’m not a very good cook, so I appreciate a cookbook that is easy to follow and has regular ingredients that are easily found. My only quibble with your review is I wish you had listed at least some of the recipes in the cookbook. But this looks like a worthwhile cookbook to check out. Thank you. I love to cook and this sounds like the perfect holiday cookbook to me. It is good to know the recipes have ingredients that are attainable and recipes are written so the home cook will be able to make them. This cookbook is on my list of must haves! With the holidays approaching, I’m looking for new healthy hearty seasonal recipes to feed my family. I appreciate that the recipes are easy to follow and that I can explore seasonal flavors found at my local farmers market. I love cooking with seasonal ingredients. This sounds like a great cookbook to have. Thank you for your review.